You'll be £19.99 closer to your next £10.00 credit when you purchase The First Jet Pilot. What's this? Order within the next 4 hours, 31 minutes to get your order processed the next working day! On 27 August 1939, Flugkapitan Erich Warsitz became the first man to fly a jet aircraft, the Heinkel He 178 and in June of the same year he flew the first liquid-fuel rocket aircraft, the Heinkel He 176. His legendary flying skills enabled him to assist the pioneering German aircraft and engine design teams that included Wernher von Braun and Ernst Heinkel. He repeatedly risked his life extending the frontiers of aviation in speed, altitude and technology and survived many life-threatening incidents. This book is written by Erich's son who has used his father's copious notes and log books that explain vividly the then halcyon days of German aviation history. Warsitz was feted by the Reich's senior military figures such as Milch, Udet and Lucht and even Hitler keenly followed his experimental flying. Little is known of this pioneer period because of the strict secrecy which shrouded the whole project - it is a fascinating story that tells of the birth of the jet age and flight as we know it today. The book includes many unseen photographs and diagrams. This book is the story of this remarkable pilot and the birth of jet flight as we know today. An easy and informative page turner, it features many previously unpublished photographs, illustrations and diagrams. This book is nothing short of a gem for anyone interested in real aviation history. I could end the review there, because in my opinion, that one sentence sums up everything about the book. However, readers will probably want to know why I thought it was so good—and the author and publisher might want me to say a bit more! 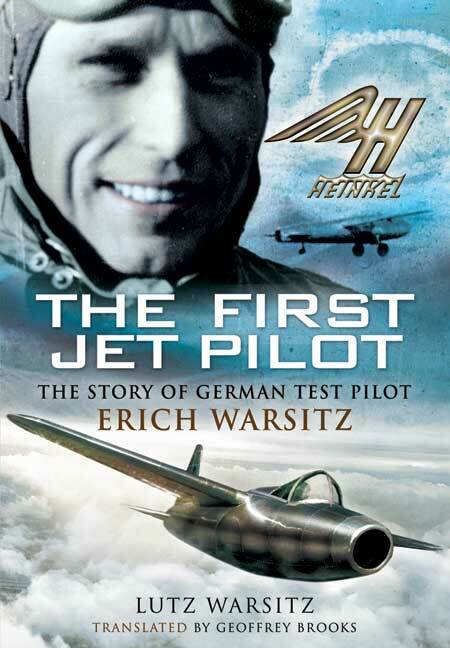 The book is—as the title suggests—the story of the world’s very first jet pilot, the author’s father, Erich Warsitz, who became a test pilot for the German Luftwaffe in the years immediately before World War Two. Some readers might be reluctant to pick up a book that has been “translated”, as the word almost invariably implies a disjointed and difficult-to-read text. Thankfully, nothing could be further from the truth. Not only has the translator, Geoffrey Brooks, done an excellent job of translating the author’s words extremely readably, he also appears to have grasped all the subtleties of humour and personality intended by the author. Making the work even more readable is the style chosen by Lutz Warsitz to present his father’s story. It could easily have been a dry historical narrative compiled from information that Erich Warsitz provided his son. Instead, Lutz Warsitz has written the book as a pseudo “autobiography” as if it were written in the first person by Erich Warsitz himself. that it was developed out of sight (and without the approval) of the German authorities. However, he tells the amusing and fascinating stories about numerous other “secrets” that were kept from the bureaucrats and German administration. Because the Allies won the war, it was Allied scientists, aircraft manufacturers and pilots who became famous—often by utilising the results of German research and testing efforts. Warsitz. These men (and women, like Hanna Reitcsh) were incredibly brave to test new aircraft, untried engines and unknown aerodynamic hurdles. Many of them died—suddenly and frighteningly. Were it not for their efforts and sacrifices, we certainly would not be enjoying the ability to travel around the world with “effortless” ease in shirt-sleeved comfort as we do today. Thankfully, Erich Warsitz survived his test-flying days. This was a major feat when flying some of the most deadly test aircraft ever to hazard the sky (and their pilots). It was even more impressive when one considers the pressure upon manufacturers and pilots under conditions of wartime urgency. Having survived WWII as well as his hazardous test-flying career, Erich Warsitz—like many German survivors—suffered significantly at the hands of the Russians after the war. After kidnapping him with the intention of forcing him to cooperate with them in their jet and rocket research—which he refused to do—the Russians sent Erich Warsitz to Siberia. The First Jet Pilot only gives a brief summary of Erich Warsitz’s Russian ordeal and his life after the war. While the rest of the book made me want to know more, it isn’t the book’s purpose. (My only complaint about The First Jet Pilot is that is isn’t longer!) Instead, through Lutz Warsitz’s words, readers share the emotions— apprehension, loyalty, fear, frustration and elation—of being part of some of aviation’s most significant advances. Despite the difficulties in sourcing images (so many German images were either destroyed during the war or taken by one or another of the “victors” afterwards), the author has come up with a marvellous selection of pictures, many of which have never been published before. would undoubtedly have made his father proud. A thoroughly recommended read. A fascinating read and an invaluable insight into the workings of pre and wartime test flying under the Third Reich. The Heinkel He 176 was a German rocket-powered aircraft. It was the world’s first aircraft to be propelled solely by a liquid-fuelled rocket, making its first powered flight on 20 June 1939 with Erich Warsitz at the controls. The Heinkel He 178 was the world's first aircraft to fly under turbojet power, and the first practical jet plane. It was a private venture by the German Heinkel company in accordance with director Ernst Heinkel's emphasis on developing technology for high-speed flight and first flew on 27 August 1939 piloted by Erich Warsitz.